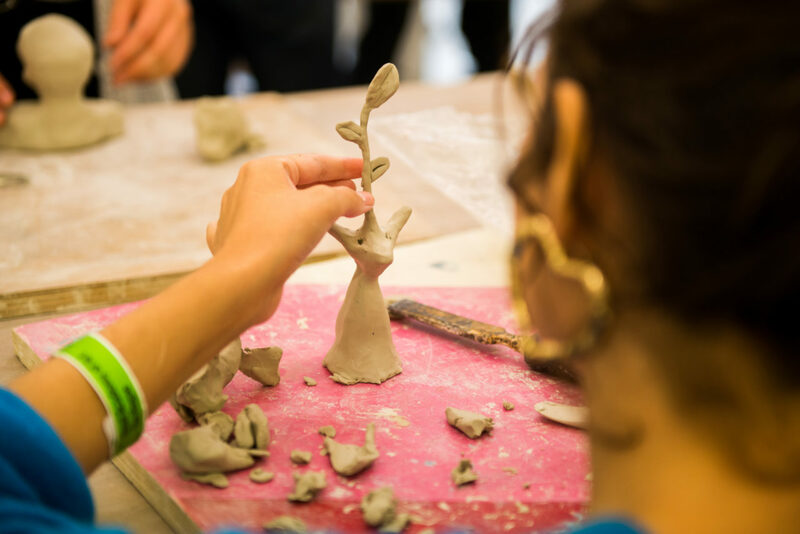 In the Ceramics Workshop, we introduce students to the traditional craftsmanship of ceramics. Discovered by accident, it has developed slowly over time into a technique that is applied even in today’s high-tech products including ceramic knives, non-stick pans, etc. It takes time and concentration to use clay and transform it from an idea into a final product, and that is mostly due to the nature of clay. It is malleable at first, but it gradually changes to a rock-hard consistency after firing. That’s why it takes planning and care to achieve the desired results. pressing clay with the extruder or pouring liquid clay in a plaster mould. Whichever method you use to shape the clay, it all needs to dry before it can be fired. Once it has been bisque fired for the first time, it could be glazed – this is the decorative and protective layer – and then re-fired. It often takes six weeks before you have your final product. You need to consider that working with ceramics takes time, and that you may not succeed on the first try. Practice makes perfect. You may use the oven (kiln) under supervision of the workshop manager. We have three kilns in the workshop: big (inside measures 110-60-80cm), mid (62-62-65cm) and small (64-43-65cm). The kilns must be reserved and paid for in advance.